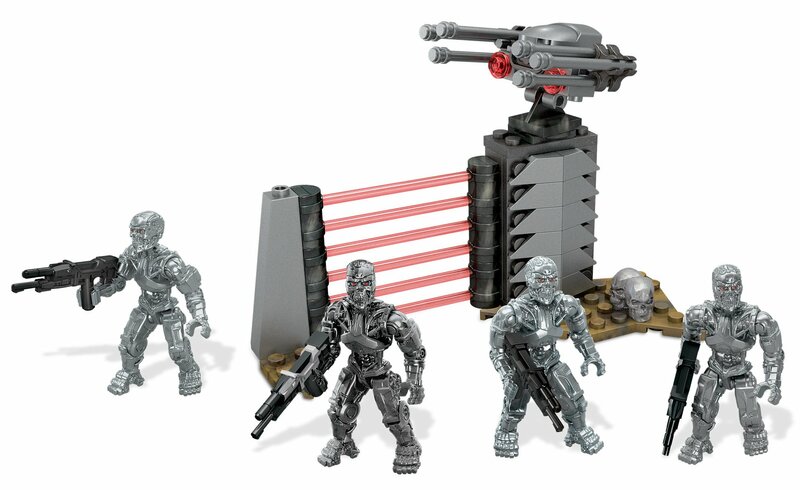 Product Packaging: Standard Packaging Build the T-800 Pack by Mega Bloks Terminator Genisys and assemble your ownimpenetrable cybernetic guard of T-800s. Mass-produced for combat andinfiltration, these four standard metal skeleton T-800 Terminator units patrolthe perimeter of the Skynet work camp, programmed to destroy any humanprisoners that attempt an escape. Build the futuristic, laser-rigged prisongate with its rotating turret gun, and set your four highly detailed,articulated T-800 micro action figures at the ready. The T-800s feature twodifferent color variants and come with interchangeable weapons forcustomization. For ages 8 and up.